Pin Wall is a collaborative public artwork by artists Sara Hughes and Gregor Kregar. Commissioned by the Napier City Council, the work is situated on the Marine Parade side of the new wing of the museum building in Napier. 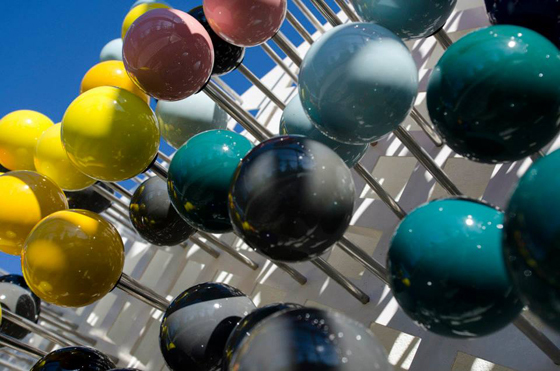 The work takes the form of a brightly coloured oversized pin cushion; created from 5000 porcelain glazed balls that project out from the building on stainless steel rods. The artists spent considerable time researching the MTG collection and wanted to create a work that responded to objects within it. They were particularly influenced by a group of 19th Century pin cushion and the Avis Higgs fabric design archive. “We have referenced a design for a textile print by Avis Higgs depicting New Zealand flora and fauna and turned it into a mosaic of colour. Each pixel of colour will be represented by a pin head; depending on how the work is viewed it can take the form of a vibrant assortment of colour and form, or from a frontal position it will make a more representational image.“ – Sara Hughes. The work takes a pin, an everyday object but one with much history; an expensive and rare item in 19th century, an object that was a common household item in the 20th Century and an item used less and less in 21st Century homes due to the low cost and availability of readymade garments. “A pin is a device used for fastening objects or material together which we think creates a fitting metaphor for the Museum.” -Sara Hughes. The differing lengths of stainless steel rod give a three dimensional effect to the work. The porcelain pin heads pop out from the side of the building creating movement across its surface as the work responds to the changing weather conditions. “We are thrilled to be creating this work for Napier and very excited that the work will soon be installed.” – Sara Hughes. The work brings a dynamic new dimension to the landmark building and is the largest work created from porcelain in New Zealand.